Recipe 16: This is a dessert my mum used to do in Christmas when there is lots of nougat remaining or when it’s easy to find it in the shops. 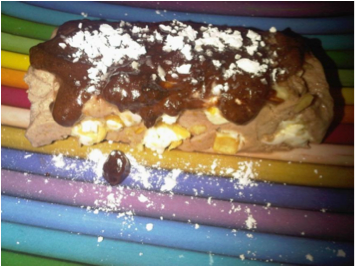 It’s a very easy dessert but served in little portions with some hot chocolate on top it’s very tasty and beautiful. Serve it to guest for a party and you will see the reactions. Ingredients for 6 people: 500gr. of whipping cream, 200 gr. nougat (better if covered in chocolate or add some chocolate in powder at the end in the mix), 4 eggs, a bit of Brandy, 150 gr. of sugar and a little cup of vanilla extract. When i speak about Nougat for me it’s always white nougat because the other it’s just chocolate with hazelnut for me. I use to love this one from Sperlari because very good but still a bit soft. Normally the white nougats are really hard to bite. Start by cutting the nougat in little little pieces, you can even pass it in the mixer if you want just to cut it finely. Then whip up the 2 egg whites while mixing the yolks egg with the sugar. Then whip up the whipping cream too (i normally use the mixer anyway) and add this too to the rest of the mix, with also some vanilla extract and chocolate if the nougat it’s totally white. At this point you will need to choose the recipient where you are going to freeze the semifreddo! I prefer to use the muffin baking tray, but my freezer it’s little and i have used a plum cake tray. Cover it with aluminum paper brushed with some brandy and put a layer of the semifreddo mix and then a layer of nougat with some drops of brandy , then another layer of the mix and another layer of nougat, always with brandy. Finish with the nougat and place it in the freezer for 4 hours before to serve. When ready to serve, cut it in slices and put some hot chocolate on top with some icing sugar. Enjoy!